Yes!! That's Ghirardelli chocolate!! And I love my little rabbit scissors!! Her book has wonderful, easy to follow directions and templates that can easily be used for more than just fusion...but applique and wool too. Her Bunnyville employees, as she refers to them, are Harrington and Hannah. 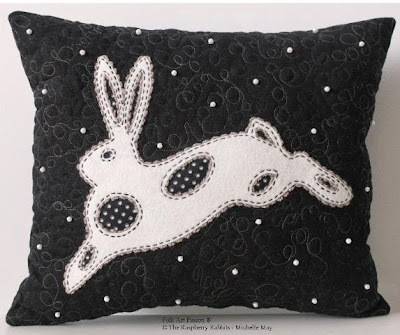 They are just as cute as this Wild Hare pattern of Michelle's don't ya think! Love Shell's blog and her work. Just tickled when the bunnies do their posts. I have no bun-buns in my quilting, so I will visit everyone for some inspiration. My daughter has 2 rescue bunnies. She got Finnigan first and then Daisy later. I made a few things with bunnies on them. In fact I just finished one but I guess I hadn't posted it yet. I better look and see if I even took a photo of it or not??!! LOL!!!! Adorable Bunnyville employees! So cute. 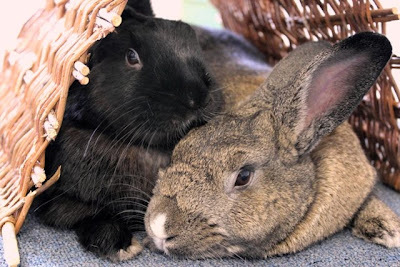 Wish I had a rabbit quilt to share. That's a pretty sweet win--especially those adorable scissors! I love Michelle, too! Just rec'd an order from her so I can make a project from her amazing book. It will make a wonderful giftie. can't believe I don't have a post on bunnies. I have written them in my mind and have quilts with them on it. Well. Fun bunnies. I love that black and white bunny pillow. I don't have a bunny post to share - I'll have to rectify that. Looks like a neat book - I"ll have to keep my out for that one also. Belated congrats on your win. Now off to see Michelle's site.